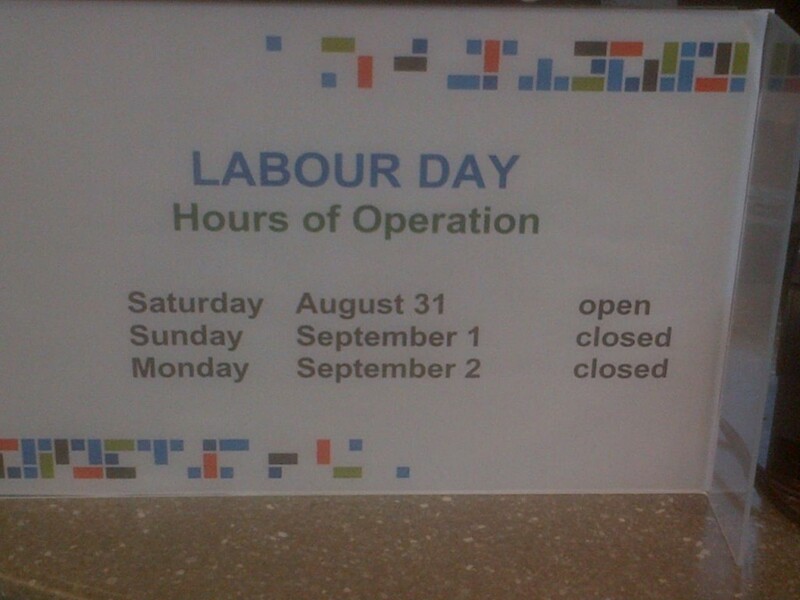 With Labour Day fast approaching the FVRL has continued to assault literacy via the signs it displays to inform patrons of the day[s] libraries will be closed as a result of the holiday. Illiteracy: a mistake in writing or speaking. Hours of Operation requires one to be in the state of being operative. If you are closed (in a state of non-operation) on Labour Day, you do not have Hours of Operation but Hours of Non-operation. 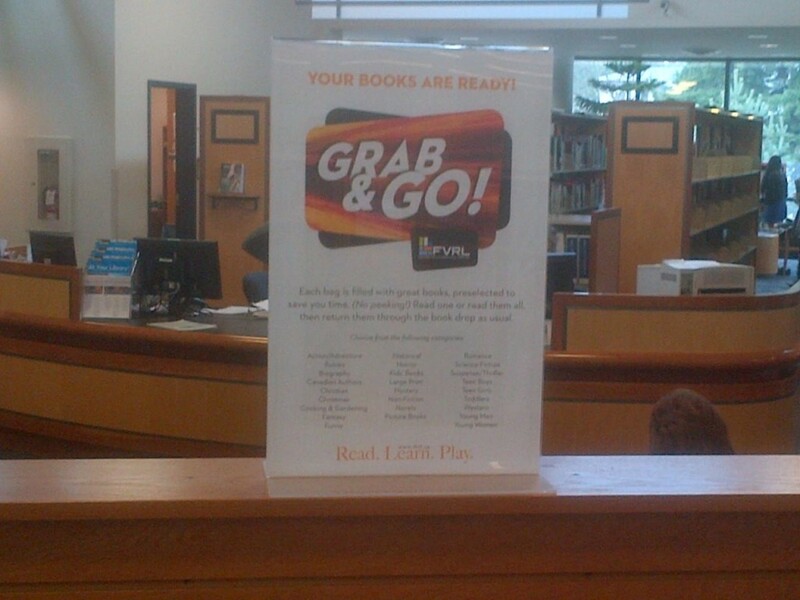 In order to ‘grab & go’, isn’t it necessary to have something to grab? 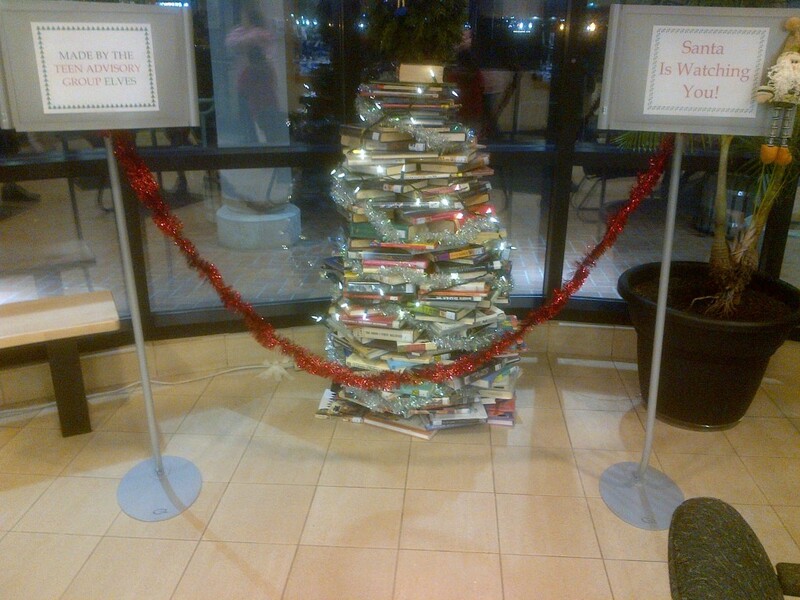 Internet social media made making a ‘Christmas Tree” using books a HOT thing to do for Christmas 2012 which led to the Teen Advisory Group at Clearbrook Library creating this ‘Tree’. And topping the tree with……. Using books to build a icon of a Christmas tree makes sense on many different conceptual levels, presenting numerous opportunities for interesting, even ingenious, use of symbolism. 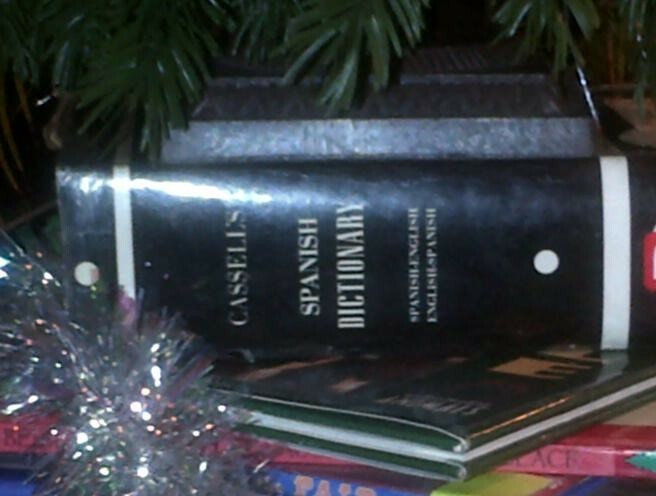 Which is what makes topping the tree with the German Dictionary (whose only recommendation as the tree topper seems to be its thickness) so jarring and out of sync with what would be a appropriate symbol to top off a Christmas Tree. 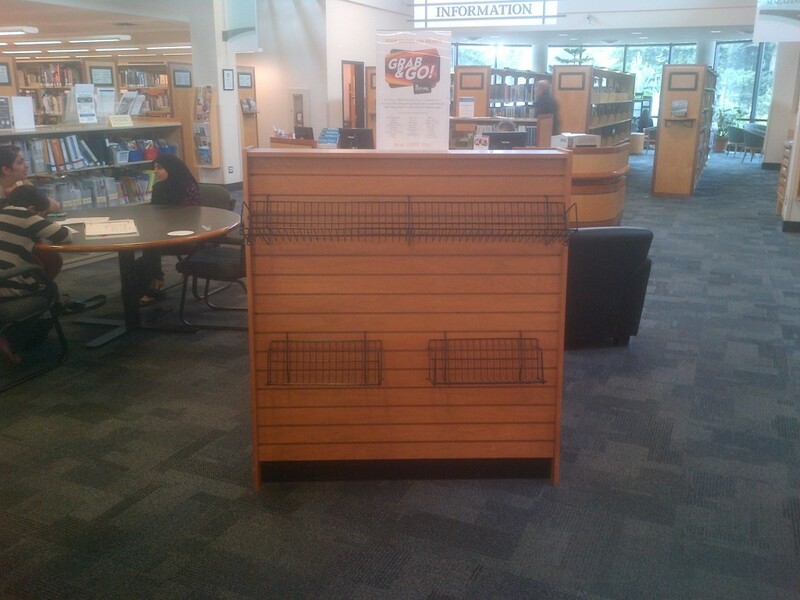 It is sitting in the entrance foyer to the library. A building whose shelves are filled with books, videos and music rife with iconic representational symbols. A building whose back wall contains a fantastic tableau consisting of carved tiles. Setting aside the assault on one’s artistic soul, a great disservice was done to the members of the Teen Advisory Group by a seeming ‘good enuf’ attitude where a big fat German dictionary was close enough (hey, a dictionaries a book – right) even if it is not in anyway befitting as the topping of their Christmas Tree. Astronomy, astrophysics, physics, star maps, mathematics, collections of Hubble photos……….metaphysics, spirituality, philosophy, mythology, Faerie………even fiction. So many possibilities to consider and stretch the mind, the imagination; so many opportunities to examine how ‘the devil is in the details’ and just how important the details can be in creating the effect you want OR accepting ‘good enuf’ and going wityh an icon as disturbing to the mind as the wailing of a banshee. 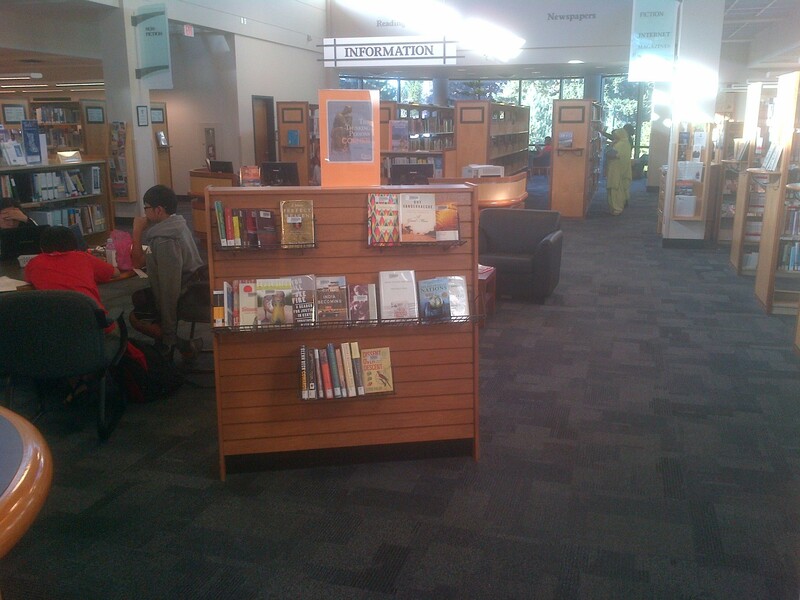 A library should embody excellence, not ‘good enough’. With all the reference books in the library you think someone would have thought to determine that Summer 2013 arrived on Thursday June 20 for places west of the Central Time Zone (10:04 pm in Vancouver); and Friday June 21 for the Central time zone eastward (1:04 am in Toronto). Say What? 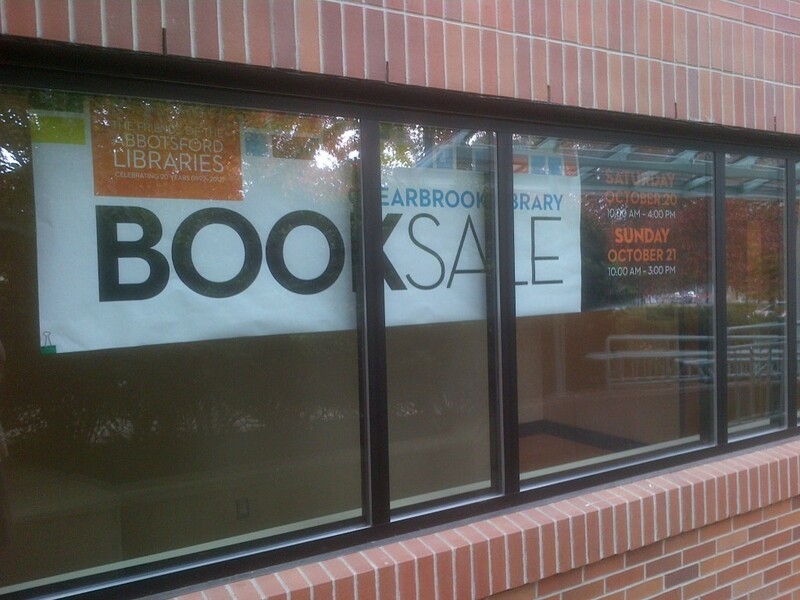 Is Clearbrook Library is holding a going out of business sale? Yes a library needs to manage the materials on its shelves. And yes, it is a good thing that the books are sold to good homes where they will be read and appreciated. 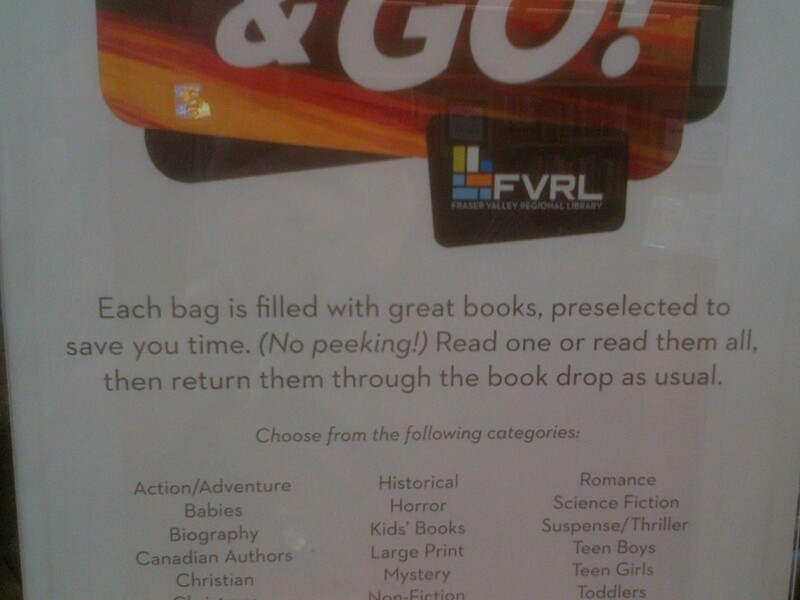 But a screaming, in your face BOOK SALE sign at a library? I say, it is just not on. All those books trapped on the shelves of the Library, forced to listen as page after page is fed into the voracious maw of the shredder and chopped into tiny pieces. Page after page of paper made from trees, just as the library’s books are made from trees. 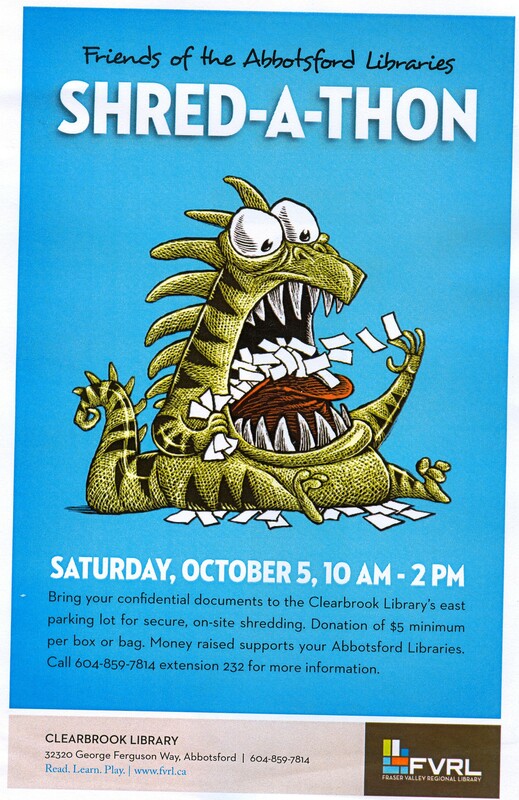 Library books that could, (shudder) easily be converted to confetti by the insatiable monster in the east parking lot. OH, the inhumanity of the psychological torture as the library books can only huddle together on the shelves, praying some kind patron checks them out and takes them away from the carnage taking place in the east parking lot. Perhaps, had this been the Stupid Persons Corner they might have gotten away with it. No, I am not referring to the failure to use the possessive form of the noun person as required in The Thinking Person’s Corner. You do need to use the possessive form with nouns referring to people, groups of people, countries and animals. You form the possessive by adding apostrophe + s (‘s) to the noun; thus Thinking Person’s (apostrophe + s) Corner is the proper form. In a library, with its foundation of language, the ‘good enuf’ attitude reflected in the lack of an apostrophe + s (‘s) appended to the work person in the sign pictured above is disconcerting and discombobulating. But that is not what makes this the pièce de résistance. 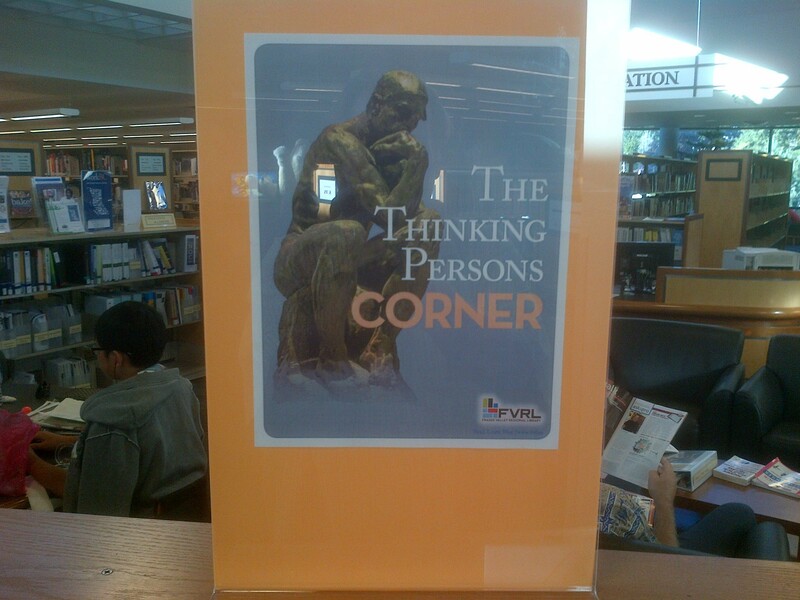 No, what makes this such an entertaining Pièce de Résistance is the fact that they have located the “Thinking Person’s Corner” in the middle of the library, far from any corner. A spatial positioning, the absurd whimsical drollness of which, thinking persons have an appreciation of. 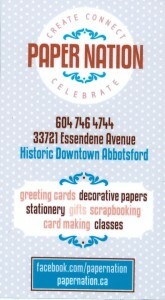 Driving through historic downtown Abbotsford my attention was caught by the name of a new addition to the shops on Essendene Avenue, Paper Nation. 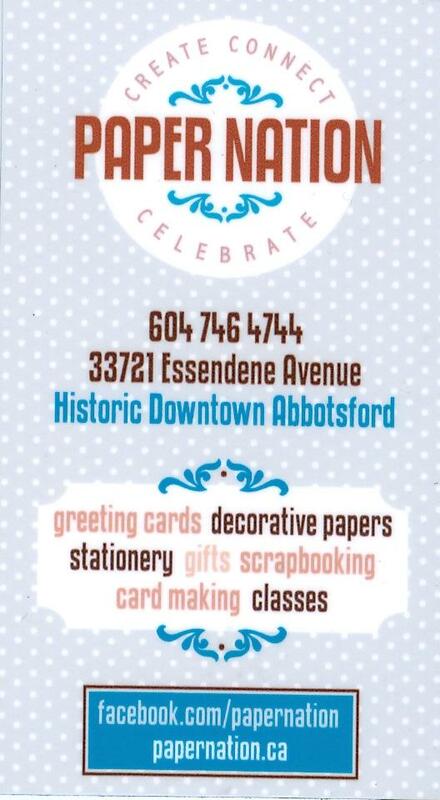 I assumed that the name meant it was a scrapbooking store. If fate had not intervened my assumption would have had me seeing a caterpillar and missing the butterfly. I was on Essendene because I wanted to run into Strung Out on Beads. The only parking spot I could find was on Pauline Street which meant I had to walk past Paper Nation on my way to and from Strung Out on Beads. Approaching the Paper Nation sandwich board on the sidewalk outside the store on my return journey to my car, I decided to pop in and take a look around. I pushed open the door and stepped into……..Greeting Card Bliss. The cards, Oh The Cards. I have added Paper Nation to my Wellness Recovery Action Plan for those black days when I need a laugh, an injection of the light of humour into my mind and life. As I sampled from one greeting card display spinner to another, the smile on my face kept growing. I am not sure what other browsers in the store thought as my card sampling brought forth laugh after laugh. I can say that owner Bryan Heidinger was pleased by my laughter. I have been accused of having a sense of humour that is somewhat askew. What can I say?I am a fan of Monty Python and George Carlin. While I enjoyed a sampling of the pointed wit cards, the cards on display and available are not limited to those with an acerbic edge. There are cute cards, funny cards, sentimental cards, friend cards, beautiful cards, flashy cards…………. All manner of cards, including some I spotted by local artists. There is an interesting array of scrapbooking supplies. 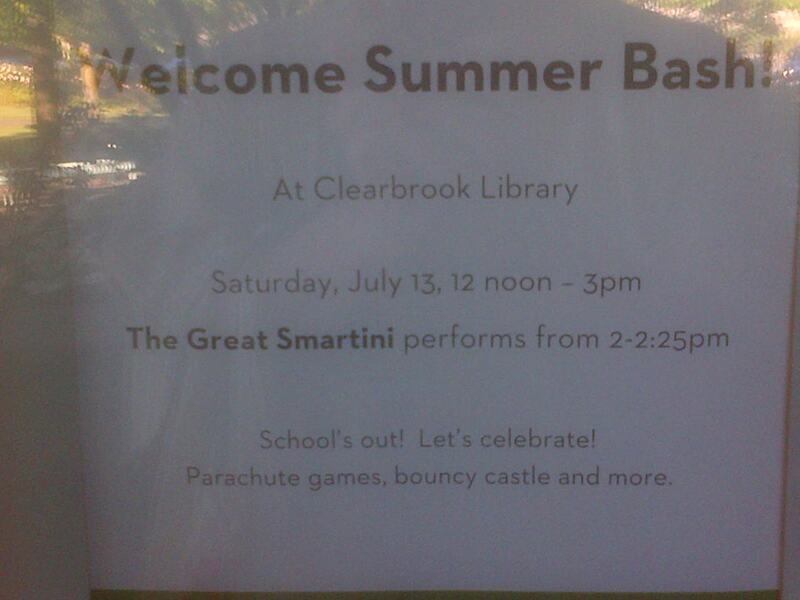 And there are classes. 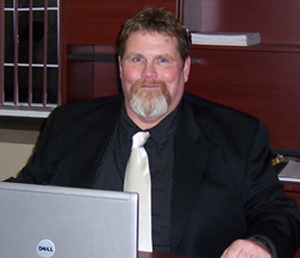 And although I am not into scrapbooking myself, observation and conversation suggests that owner Bryan Heidinger is a valuable resource for those who are scrapbookers. I was impressed enough by my visit to Paper Nation that as I was leaving I asked Bryan if it was alright if I wrote about my visit. He is waiting on business cards but gave me a fridge magnet. You can visit the website at papernation.ca or facebook at facebook.com/papernation………… but to really appreciate the store – a locally owned store – and its owner you need to drop in. P.S. I had intended to be disciplined and merely browse, but the varied items and cards available caused me to Shop. I blame Mr Heidinger, who had stocked the store with a few items that forced me to Shop.